The zebrafish larva, Danio rerio, provides superb genetic access for studying how systematic variations in behavioral profiles relate to differences in brain activity. Larvae respond predictably to various sensory inputs and their nervous system is readily accessible. Also, their transparent body allows for noninvasive optogenetics and their small size allows for measuring behavior with full environmental control. In tethered larvae, neural activity has been correlated to eye and tail movements. The challenge now is to tackle the building blocks of behavior: internal states (maturation and learning), motivations (drives), reversible phenotypic adaptations (humoral actions), and decision processes (choice and task selection). These phenomena are best addressed through the analysis of freely behaving subjects. This chapter provides the basics for applying optogenetics to the analysis of behavior in freely swimming larvae. 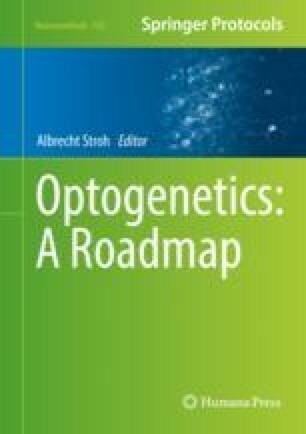 As a study case, we offer information from recent tests showing how optogenetic manipulation of hormone-producing cells can be used to address reversible phenotypic adaptations. Because larvae are highly reactive to optic stimuli, light control is pivotal in employing noninvasive optogenetics. This point is covered in detail, starting from the general rules of light delivery and maintenance prior to the tests.